TOS is non negotiable and any commissioner/buyer is expected to read and understand all terms. AunumArt Custom Creations is not liable for any damages caused by the use of it's site or it's products. Wearing a "Fursuit/ Mascot costume" may heighten the performer's risk of heat related illnesses, we are Not responsible for any stumbling, falling, slipping, tripping, or overheating that may occur. It is the performer's responsibility to use their ​"Fursuit/ Mascot costume" responsibly. Please remember to be safe and well hydrated while suiting and of course have loads of fun! Please note we do not take commissions from minors. Customers under 18 years of age and are seeking a commission must do so through a parent or legal guardian. Parents/legal guardians must act as the intermediary between AunumArt Custom Creations and the minor, including all communication pertaining to the commission. Parents/legal guardians must be responsible for submitting the commission application and for providing payment. We require a photo of the paying customer's Driver's License/ Identification card (with Legal name and birth date being shown) before initial payment is made. Initiation: How To Get Started. Potential customers can receive a quote by going to the Costume Commissions page and filling out the contact form at the bottom of the page and filling it out properly. You should receive a response from me with your quote within 1-2 weeks. Please note when filling out our contact form please be sure to consider where you want your zipper, whether you need your head fitted for glasses, and other practical details. Required: One or more detailed image(s) of your character/subject matter. Multiple images showing a 360 view of your character/subject matter are preferred (front, back, both sides, etc.) Proper reference sheet must include enough views of your character to properly display all markings. References must be 2D style artwork and please avoid any excessive shading that might obscure your markings. Reference art must be colored. Optional: A short, written description of key features of your request that may not be obvious in the reference images. No more than three (3) to five (5) sentences, describing physical details such a colors, markings, scars, accessories, powers, etc..
For example, if the request is for a character that is a dog, helpful info could include breed, color, personality, age, etc. Please refrain from sending any details or material about the character/subject matter that do not directly apply to the commission requested. Keep in mind that AunumArt Custom Creations CANNOT make copies or 'recolours' of any existing the fursuit characters, I also CANNOT accept copyrighted characters. ​Total cost does not include shipping prices, which vary from region to region and this expense is the responsibility of the buyer. AunumArt Custom Creations does offer payment plans for commissions exceeding $100. Once deposit is payed the customer is responsible for paying their total cost within six months of the project start, or commission can be dropped; but payments are not required until the project is started. Customer can make payments of $300 or more in a discussed payment plan until 30 days/1 month prior completion time. If payment is not provided within 30 days/1 month of the commission's completion, the commission will be considered abandoned. Once a commission is considered abandoned, the project will remain AunumArt Custom Creations property. AunumArt will have the right to sell the project without altering the character. AunumArt Custom Creations is unable to provide absolute deadlines, just completion estimates. On rare occasions we are able to do rush orders which will incur an additional fee, the amount of which depends on the complexity of the order and the requested completion time, rush order fees are non-negotiable . It is completely the decision of AunumArt custom Creations whether or not we will agreed to a rush order, we have the right to refuse rush order requests. It is the responsibility of the customer to provide accurate measurements so that way can delivery properly sized products. 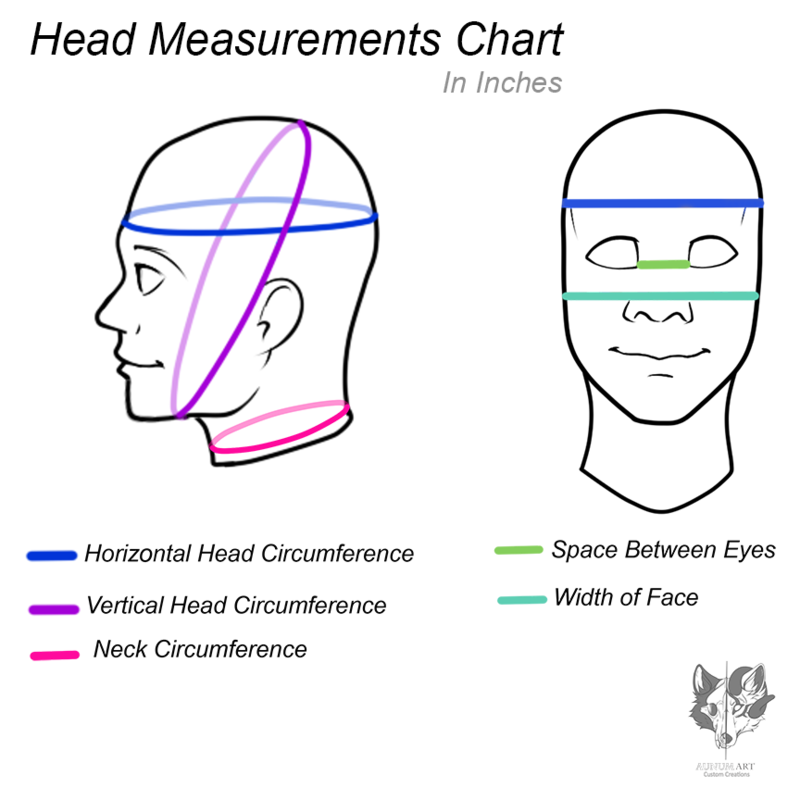 For fursuit/mascot heads we require customers to provide head measurements including: Horizontal and vertical head circumference, neck circumference, space between the eyes, and width of the face all in inches (for clarification see diagram below). 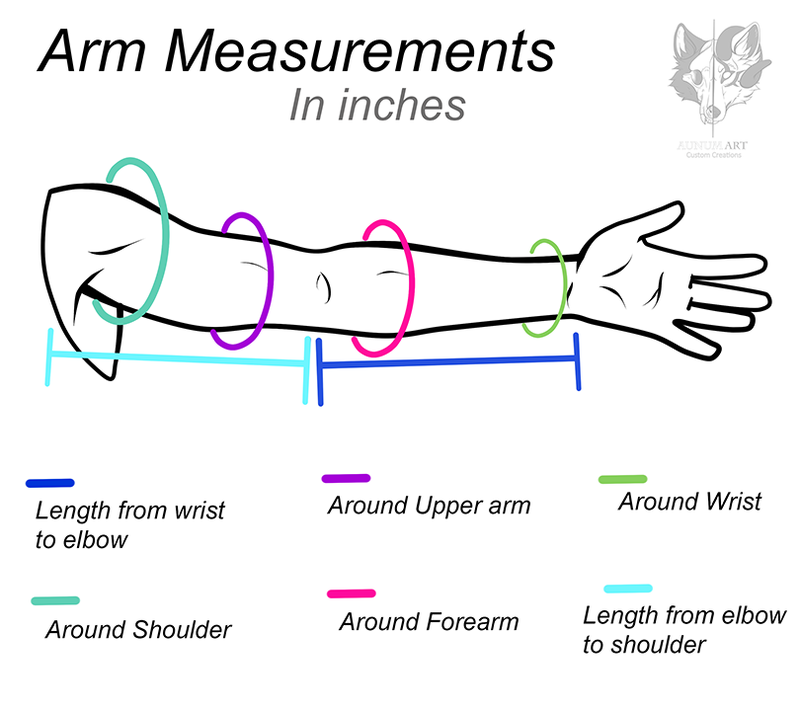 For "hand paw" commissions we require customers to provide hand measurements including: length from wrist to middle finger tip and hand width in inches. (for clarification see diagram below). 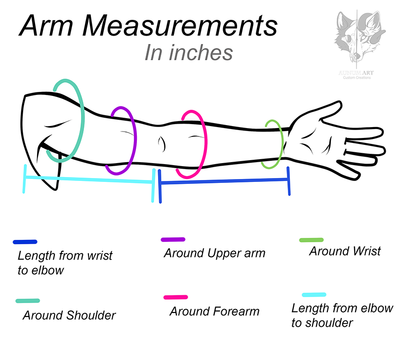 For "Arm Sleeve" commissions we require customers to provide Arm measurements including: length from wrist to elbow, length from elbow to shoulder, and measurements around wrist, forearm, upper arm and shoulder. (for clarification see diagram below). For the full suit commissions we require a Duct Tape Dummy. Please be sure to use strong and good quality duct tape. Any poor quality and falling apart DTD will not be accepted. 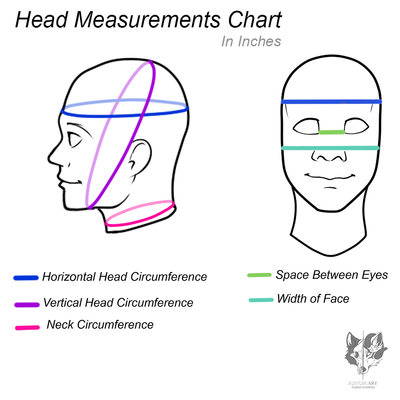 We will also need your head and hand measurements and foot size. Duct tape dummy must be made on painting suit and taped back together. If building a duct tape dummy over clothes please make sure clothes are lightly used and cleaned thoroughly or built over never before worn clothing. For fixing DTD will be charged additional fee. There is no refund on the initial 30% or 50% deposit. Refunds are only available if AunumArt Custom Creations is unable to complete the project or cancels the project. If we AunumArt Custom Creations, cancel the commission before completion the product is shipped as is and a refund is given according to the amount of work that was not completed, minus shipping costs. The same does not apply for commissions that are cancelled by the customer. If the customer cancels in the middle of the project then any payment already made is forfeit and nonrefundable. If the customer cancels, they are required to fully pay the amount due for any work already completed by AunumArt or any work that is more than half way completed. The refund for any work that is less than half way completed will vary on how much progress and time was invested. If the customer refuses to pay or cannot pay within thirty days of the termination, the product will be considered abandoned. AunumArt Custom Creations reserves the right to cancel any commission and to refuse and refund in full at our own choice. ​If your suit arrives with any fitting issues, or is defective in some way please contact the artist right away to arrange for an adjustment. Your fursuit has a 3 month warranty from date of arrival to you, the buyer. This covers repairs on rips, popped seams, sizing adjustments, and adhesion failure. If damage occurs please contact us immediately to arrange for the fix. Buyer pays shipping to seller, and seller pays shipping back to buyer. Warranty does not cover damage incurred from misuse, or rough-housing in suit. AunumArt Custom Creations reserves the right to deny any customer service for reasons to be determined by the artist. This includes if the commissioner is rude, threatening or otherwise unreasonable. Harassment, determined by the artist, is not tolerated in any way. Should the commissioner display harassment of any sort, the artist reserves the right to drop the project without any warning. Additionally, the artist reserves the right to blacklisting commissioners. Being blacklisted is defined in this document as the barring from any further services. I will be sure to give you an estimate after Payment (or first payment). A. You're suit will be shipped to you via carrier of our choosing after all payments have been received. ​By paying the invoice, the client affirms that they have read, understood, and agreed to the above terms and conditions.